Just a few moments of your time could save you thousands of dollars in mobile home financing charges on your mortgage. 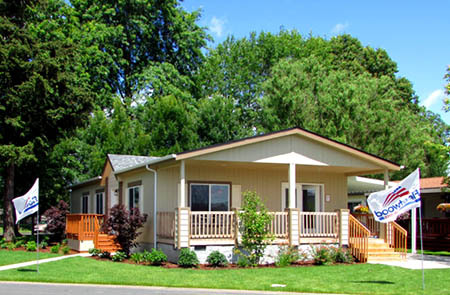 We make it easy to get a mobile home loan in Oregon with many types of programs from nationally recognized lenders. We offer a variety of options to fit your individual needs. We have helped thousands of satisfied clients save thousands on their mobile home loan rates and financing charges. To begin finding the best manufactured home loan programs and options for you, please give us a call at (800) 238-9202 or fill out our online application. Our professional, friendly and informed Oregon loan specialists are ready to discuss your financing options. Give us a call at (800) 238-9202 or complete the short request form below and we'll be in touch with you right away. Our Fast, Easy & Secure online application process is designed to save you time and money. We have no upfront application fees and quick loan processing. *Please double check your email and phone. Secure Site. We respect your privacy. "Many thanks for helping us with securing our “in-park” mobile home loan and insurance. Your company was very professional and closed our loan very quickly." We make Mobile Home Financing in Oregon easy with many home loan programs from nationally recognized lenders, fitting your specific needs. Copyright © 2018 Financial Services Unlimited. All Rights Reserved.